Unlike most of his illustrious contemporaries, Sautet delved into the lives of the bourgeois not with the desire to spew contempt or ridicule, but to empathetically portray their disappointments, failures, and the few moments of joy in in between. This extraordinarily beautiful, resonating and poignant ode to the unrealized dreams, trampled idealism, profound regrets and quietly shattering heartbreaks of three seemingly successful middle-aged Parisians, could easily serve as the apotheosis for the afore-mentioned theme. 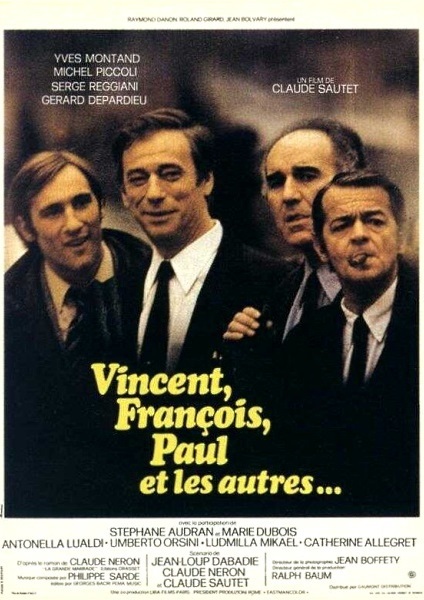 Vincent (Yves Montand) is a charming person and the owner of a manufacturing firm, Vincent (Michel Piccoli) is a doctor with a thriving practice and a reserved man, and Paul (Serge Reggiani) is a gregarious guy and a writer of repute. However, unbeknownst to most, Vincent is in acute financial crisis and is heart-broken on account of his separation with his wife (Stephan Audran) with whom he’s still deeply in love with, Vincent is shattered on account of the cold shoulder he gets from his philandering wife (Marie Dubois) that has turned him into a cynic, while Paul is suffering from a severe case of writer’s block. And thus Sautet provides us a delicately rendered and deftly chronicled peek into the lives of these three friends who smoke, drink and have a merry time when together, but suffer from personal anguish, loneliness and melancholia when removed from public eye. All the three leading men gave superb performances, but Montand was particularly brilliant in the way he managed to so effortlessly convey a volley of emotions just through facial expressions and body languages; and the café scene where he makes a bumbling and futile attempt to win back his wife was simply devastating. "This extraordinarily beautiful, resonating and poignant ode to the unrealized dreams, trampled idealism, profound regrets and quietly shattering heartbreaks of three seemingly successful middle-aged Parisians, could easily serve as the apotheosis for the afore-mentioned theme." Beautiful capsule here Shubhajit, and a dead-on assessment of one of this exceptional artists's best films. Montand is indeed extraordinary, especially in the famed cafe scene. Here is my own ranking of the five Sautet films I have scene, though I do like very one. Thanks a lot Sam for the appreciation. I just can't seem to have enough of this incredibly heart-rending film. And Montand just bowled me over! Thanks a lot for the list. Great to see Un Coeur en Hiver topping your list, and this film coming just after another of his famed works, viz. Cesar et Rosalie. Plan to watch Cesar et Rosalie, Les Choses de la Vie, and The Big Risk (which some call his best work) soon.